The Computer has progressed tremendously in the field of modern technology. It has become the basic need of modern generation. As it make many tasks easier to do, it is used by almost every person who works in the field of technology and in office. A computer is a general purpose device that can be programmed to carry out a set of arithmetic or logical operations automatically. Additionally it may be used for many purposes like playing games, watching movies, storing files etc. Now there are many modifications done in the computer, for making it compact and handy like laptops but as we all know, that development and advancement never stops, so still some more modifications are being done. 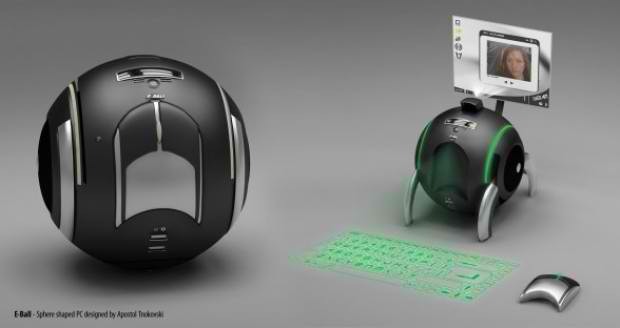 A new concept of PC is coming now that is E-Ball Concept PC. This miraculous concept portray a sphere-shaped computer, which is the smallest design among all the laptops and desktops. This concept PC will measure 160mm in diameter and it is designed for operating system of Microsoft Windows.it has all the features of a traditional computer like mouse, hard drive, DVD, mother board, large screen display, webcam, modem, LAN & WAN slots etc. It is designed to be placed on two stands which can be opened simultaneously pressing & holding the two buttons located on each side. Features of E-Ball contains around 350-500 GB of hard disk with 5GB RAM. It consist of two speakers of 50watt each. It has a laser keyboard. It can also contain a LCD projector. It has wireless optical mouse. It has a button & when you press this button a projector will pop and it focus the computer screen on the wall which can be adjusted with navigation keys. The software interface of E-Ball concept PC is highly stylized with icons that can be remembered easily which support all type of windows operating system on this computer. Once you turn on the pc, click on the mouse button to detach the optical mouse and there is also a similar laser keyboard. The ultimate feature of E-Ball computer is that when we close it no one can guess that whole computer is hidden in the ball. 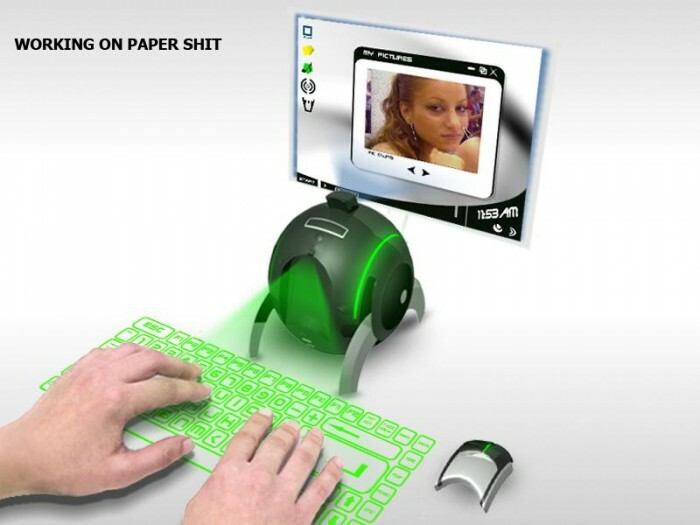 It has a virtual keyboard which is a projection keyboard that is projected and touched on any flat surface. This keyboard basically uses the principle of sensor technology and artificial intelligence to let users work on any surface. When you press the keyboard button, it is projected optically on the flat surface and the user touches the key’s image, the optical device detects the stroke and sends it to the computer. It has ability to minimize the risk for repetitive injuries of strain but in other case it is very costly ranging from 150 to 200 USD. The room in which the keyboard is projected is not so bright so that the visibility of keyboard is not affected. So far as it involves typing in air, it requires a little practice. This PC basically uses LCD projector, which can display or project information or video onto a flat surface. LCD projectors contain a separate glass panel for each and each consists of two plates of glass with a layer of liquid crystal between them and when a charge is applied, the crystals open to allow light through or close to block it. This process of opening and closing pixels forms image. As the time is passing, the computer’s size is becoming smaller. But ultimately this E-ball technology has taken the computer technology to new skyline.